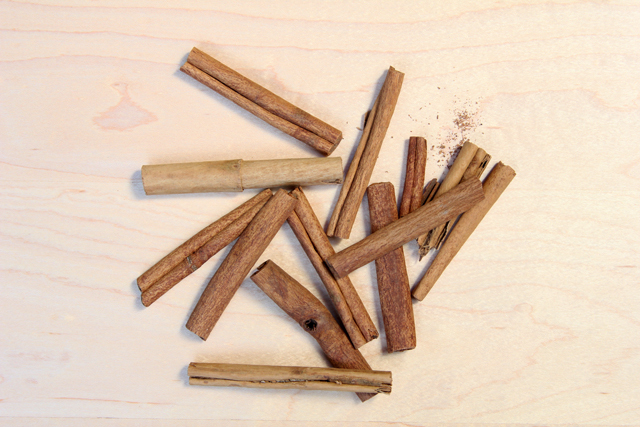 Let’s ID the cinnamon sticks you’ve been storing for your next batch of homemade chai. If you don’t have any in your cupboards, you can probably find one on your Christmas tree. If the bark is thick and rolls cleanly in one piece, it’s most likely cassia cinnamon (Cinnamomum aromaticum). If the bark looks thin, with multiple layers, it’s most likely true cinnamon (Cinnamomum zeylanicum). The two species, Cinnamomum aromaticum and Cinnamomum zeylanicum are not interchangeable, mainly because of the differences in their coumarin content. Now hear me right, I did not say CoumaDin. If I said Coumadin, it would mean that God put Wafarin in your cinnamon. But he didn’t. He put coumarin in it. Coumarin is a plant constituent that has no anticoagulant properties, but its fermentation product, dicoumarol, does. The real concern with coumarin lies in its hepatotoxicity (another big word, I’m so sorry!). Hepatotoxic = liver toxic. Depending on your liver enzymes, ingesting high amounts of coumarin can basically equate to swallowing liver poison. 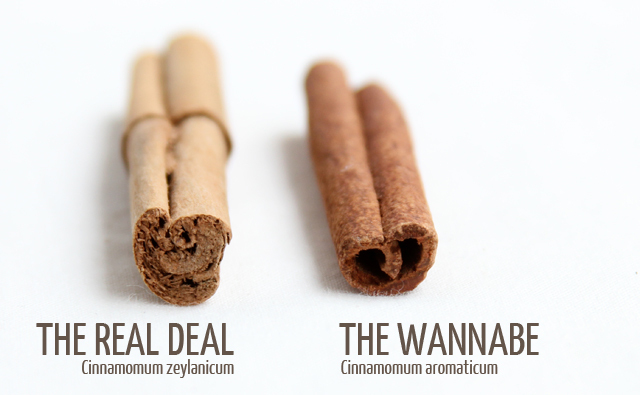 True cinnamon has a minimal amount of coumarin (about 2.4 mg/kg of bark powder). Cassia cinnamon has lots more coumarin (about 1250-1490 mg/kg of bark powder).1 You might have noticed that I have a bitty infatuation with saigon cinnamon, but unfortunately, it’s the cassia type that has more coumarin. Maybe I should cut back. The best way to utilize cinnamon’s antimicrobial activity is to use its essential oil, which can be used both topically and internally. Make sure to dilute it in a carrier oil. Cinnamon has a thing for the respiratory system, so it can be really useful in the treatment of respiratory infections. Insulin resistance occurs when the insulin receptors in your body start giving the middle finger to insulin. This causes all kinds of blood sugar problems. The good news is that cinnamon is here to get those insulin receptors to give the thumbs up to insulin instead of the bird. There is conflicting evidence on cinnamon’s use in diabetes, but because of its mechanism of action in the body, it may help to delay the onset of type II diabetes by improving insulin signaling. Because cinnamon is both astringent and hemostatic, it can do wonders for heavy periods. For these same reasons, it can also help to control bleeding from fibroids and be used as an herbal treatment for mid-cycle bleeding. Forgive me for using my Pappy’s word for diarrhea. 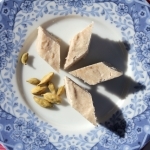 Cinnamon’s astrigency can help to dry up diarrhea. I’ve found it particularly useful for normalizing loose stool in kids after a Rotavirus infection. Cinnamon also happens to be a mild carminative, which can help to soothe any gas that may be occurring with the diarrhea. Consuming high doses of cinnamon in pregnancy or lactation is not recommended. A food allergy to cinnamon is possible. Because cinnamon is a warming herb, some people may experience mild reddening of the skin where it has been applied topically. If you would like to start taking cinnamon therapeutically, please consult your naturopathic doctor. A licensed healthcare practitioner can tailor the dose according to your needs. 1. Yarnell, E, Abascal, K. Plant Coumarins: Myths and Realities. Alternative and Complementary Therapies. Vol 15. Feb 2009. 2. Yarnell, E. Phytochemistry and Pharmacy for Practitioners of Botanical Medicine. Healing Mountain Publishing, Inc., 2004. 3. Powell, Dirk. Endocrinology & Naturopathic Therapies. Ninth Edition, 2010. Your welcome, Kelsey! Thanks for reading it! Shared on Facebook. Thanks so much, it’s so helpful to be able to see the difference.